This is a bit of a departure from the low and slow comfort food we’ve been making here at Eats For All Ages. This recipe is perfect for a mom and dad date night, but it’s also quick enough to make for a family dinner – and the flavors will make everyone happy regardless of the occasion. The fish roasts quickly at a high temperature and the greens get a quick saute while the fish is cooking. Everything makes it from fridge to table in less than 30 minutes. 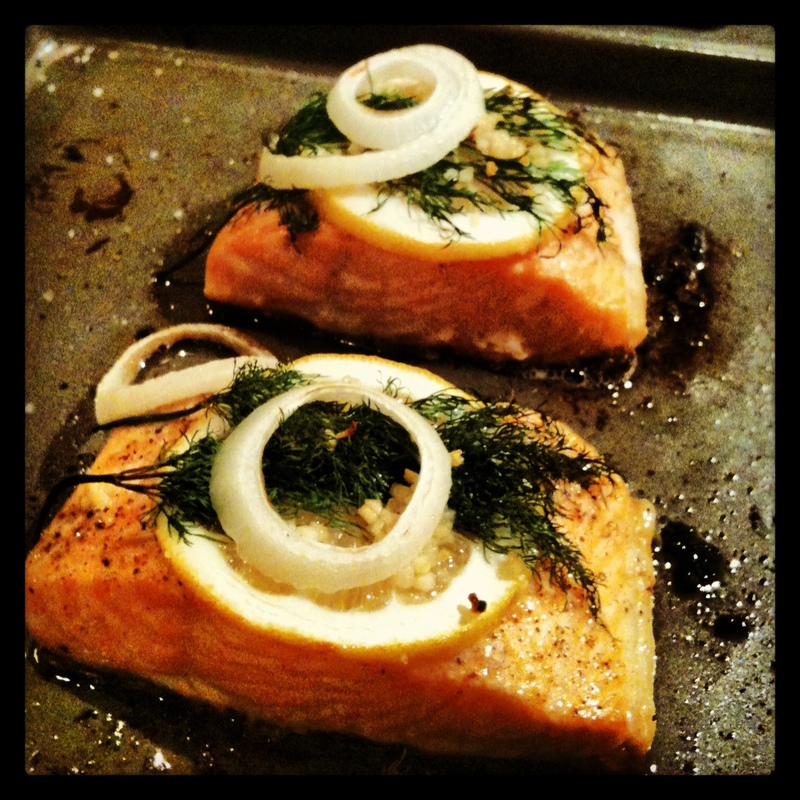 Fish was one of the last entrees I tackled when I first started cooking because it can be very intimidating. The margin of error on cooking is less forgiving, and the cost can feel prohibitive when you’re not sure how things will turn out. This recipe is a great introduction to cooking fish if you’re new to it, and it’s a great go-to procedure for more seasoned home cooks as well. Preheat your oven to 450 degrees. 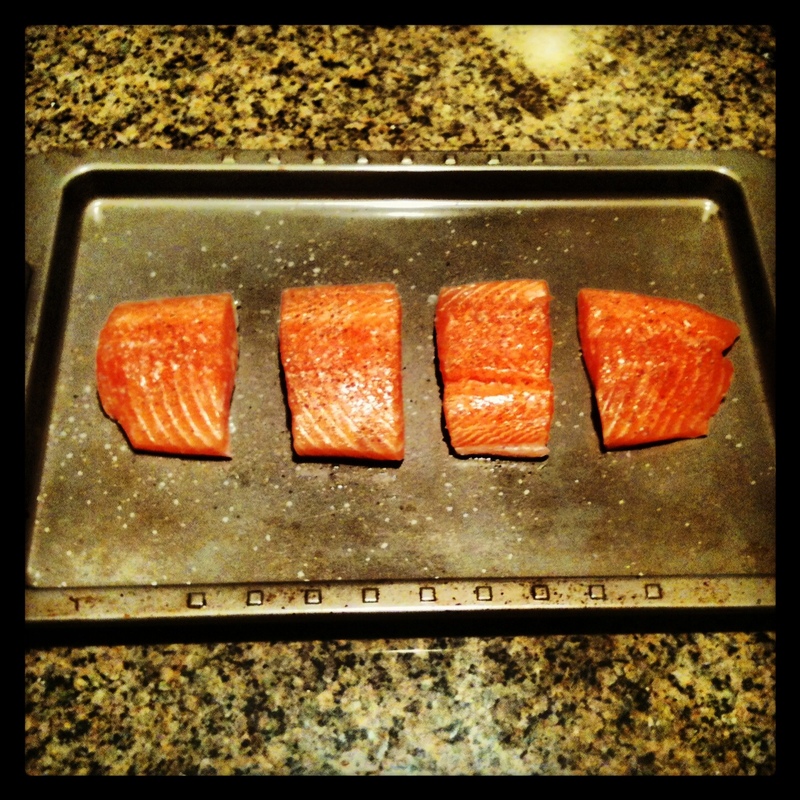 Trim your salmon into 4 roughly equal portions and place them skin side down on a non-stick baking dish. Season with salt and pepper. Place a little pad of butter on each fillet. You could add a little olive oil instead, but, when it comes to fish, there’s really no substitute for real butter. I prefer salted butter, but you can use unsalted if you prefer a sweeter flavor. Next, lay a thin lemon slice over the butter. (Be sure to remove the seeds so you’re not fishing them out later.) Lay a few sprigs (is that what they’re called) of dill over the lemon. 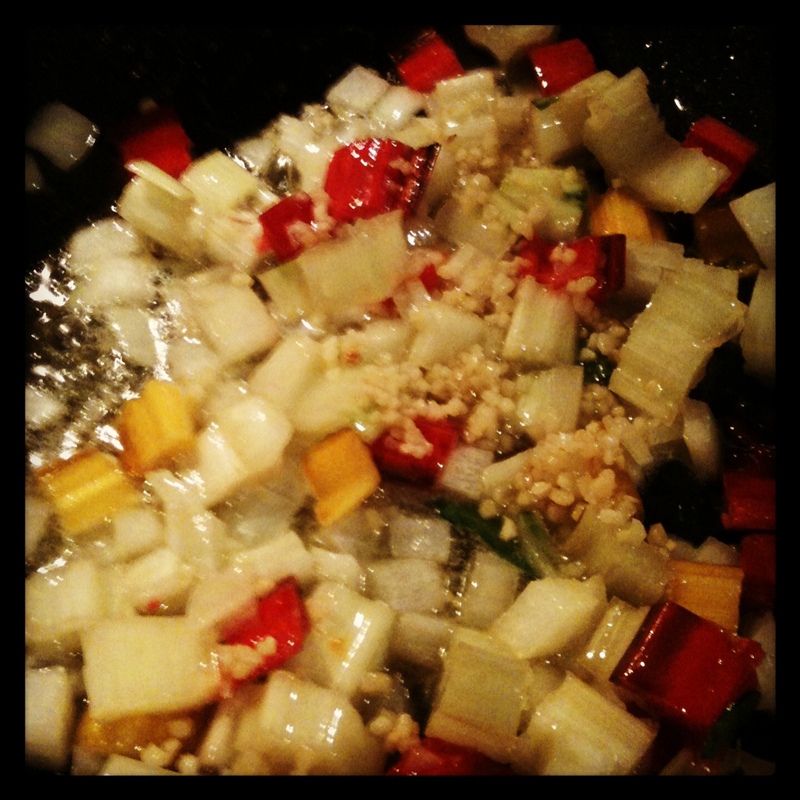 Place one clove of minced garlic on top of the lemon, and then lay a ring or two of onion over that. Place the salmon into the oven and roast for about 15 minutes until the fish is just cooked through and flakes easily with a fork. 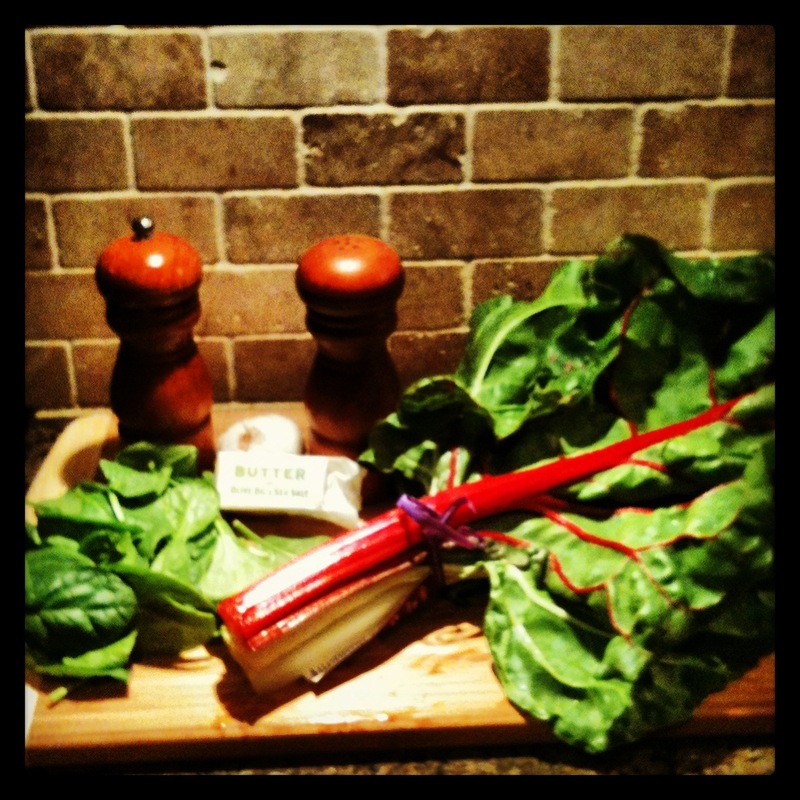 While the fish is in the oven, turn your attention to the swiss chard. In a large skillet or saute pan, heat a mixture of butter and olive oil. The butter will provide flavor, but it can be cut with some olive oil to reduce the fat content. If you’re feeling extra indulgent, you can use all butter as well. 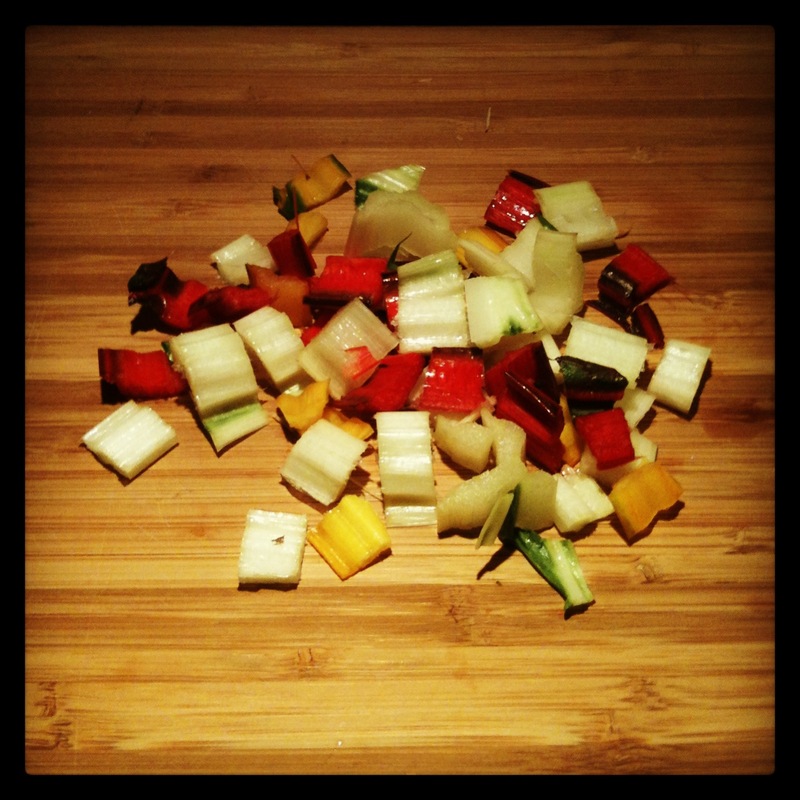 Saute the onion, garlic and chard stems for a few minutes to soften them and season them with a little salt and pepper. 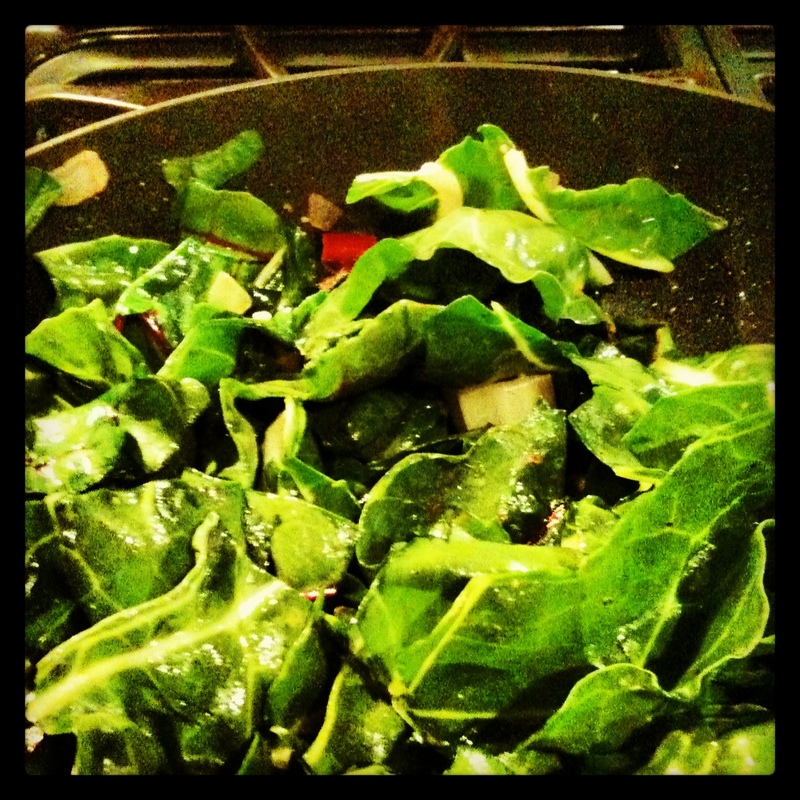 Roughly chop the leafy portions of the chard and add them to the pan. Add a little more oil or butter if necessary. The pan will be pretty full, but gently keep the leaves moving in the pan until they start to cook down. As they soften, it will get easier to saute them. Turn down the heat and cover the pan for the last few minutes. 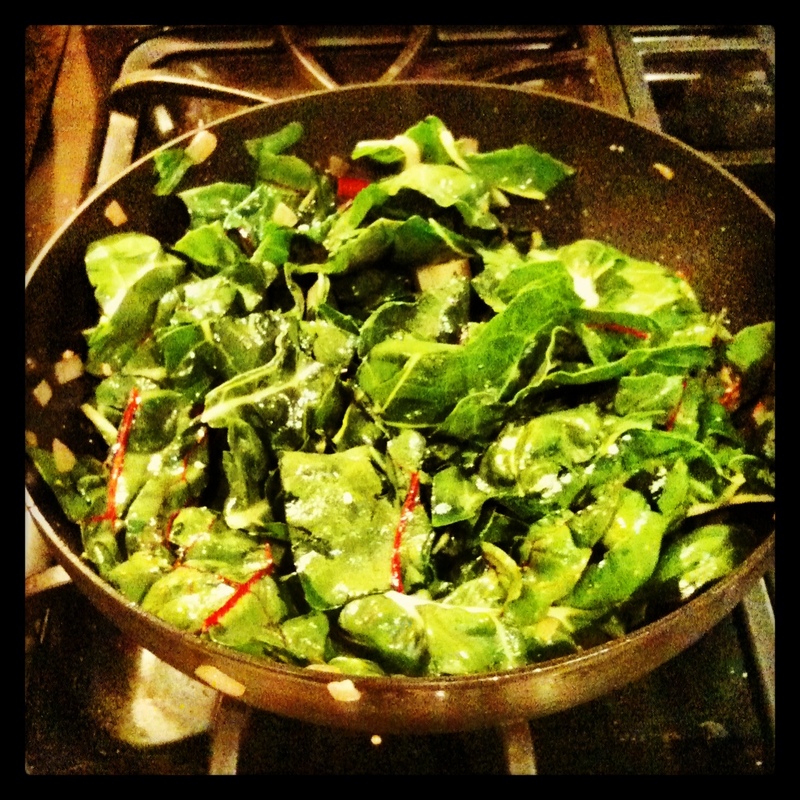 The chard will take on a brighter green color as it finishes cooking. 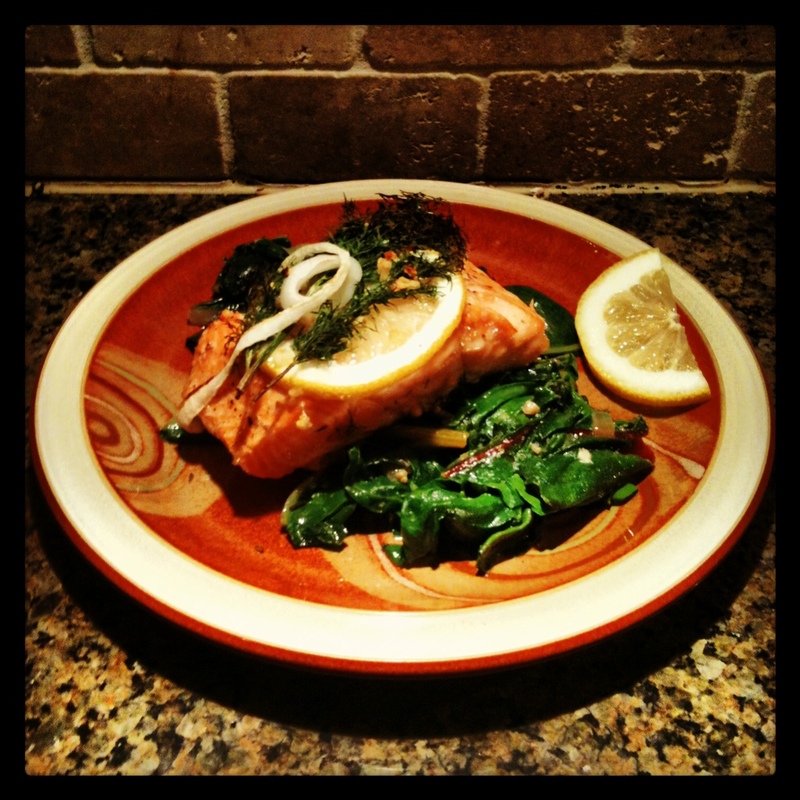 When your fish is done, plate a layer of the chard and lay the fish over the bed of greens. Speaking of the fish, it is probably just about done, so let’s turn our attention back to the oven. 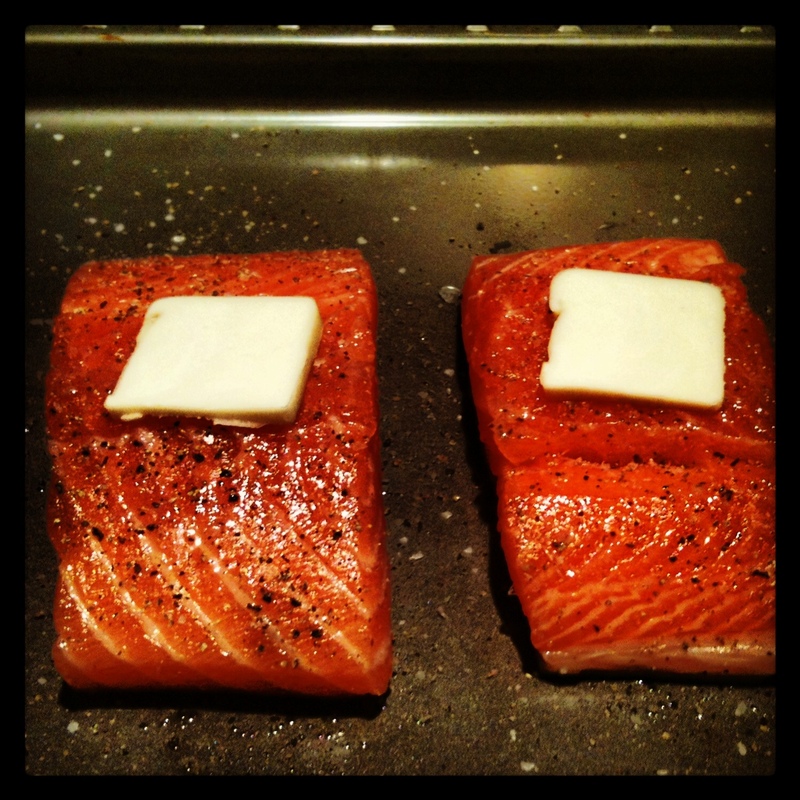 Pull the fish out of the oven and let it rest on the baking sheet for a few minutes. 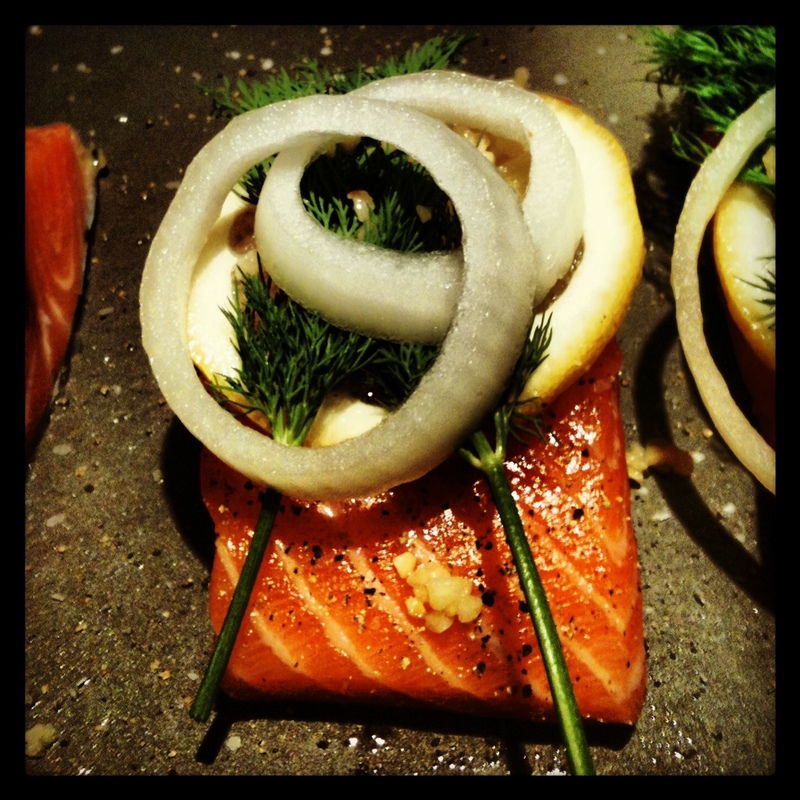 Carefully slide the salmon off the cooking sheet with a spatula. If the skin sticks to the cooking pan, just carefully slide the spatula between the fish and the skin. I actually prefer when this happens as it is easier to eat when the skin is left behind, especially when serving the fish on top of the greens. I like to serve all fish with a fresh wedge of lemon for squeezing over the fish. 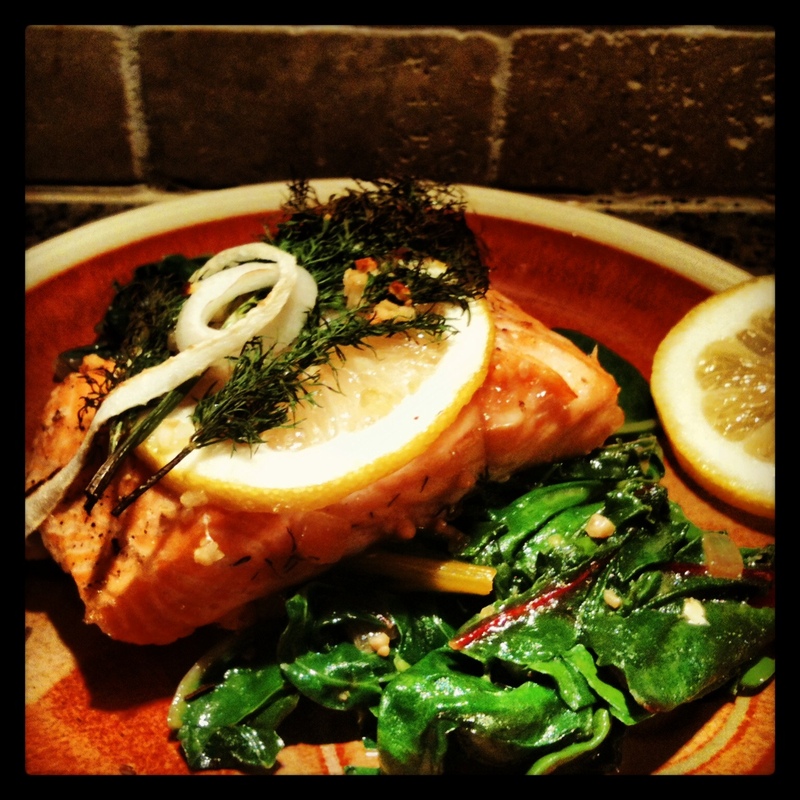 Even when the fish has been cooked with a lemon slice, as in this recipe, there is something I enjoy about the fresh lemon added after the cooking is complete. In addition, while there are no photos of him or his plate, the little guy at Eats For All Ages LOVED his salmon and even asked for seconds. In full disclosure, he did not take to the chard and ended up having some leftover peas instead. But, I still think it is a victory that this fish was tasty enough that a 15-month old boy enjoyed it, and mom and dad definitely enjoyed the bed of chard. Enjoy! 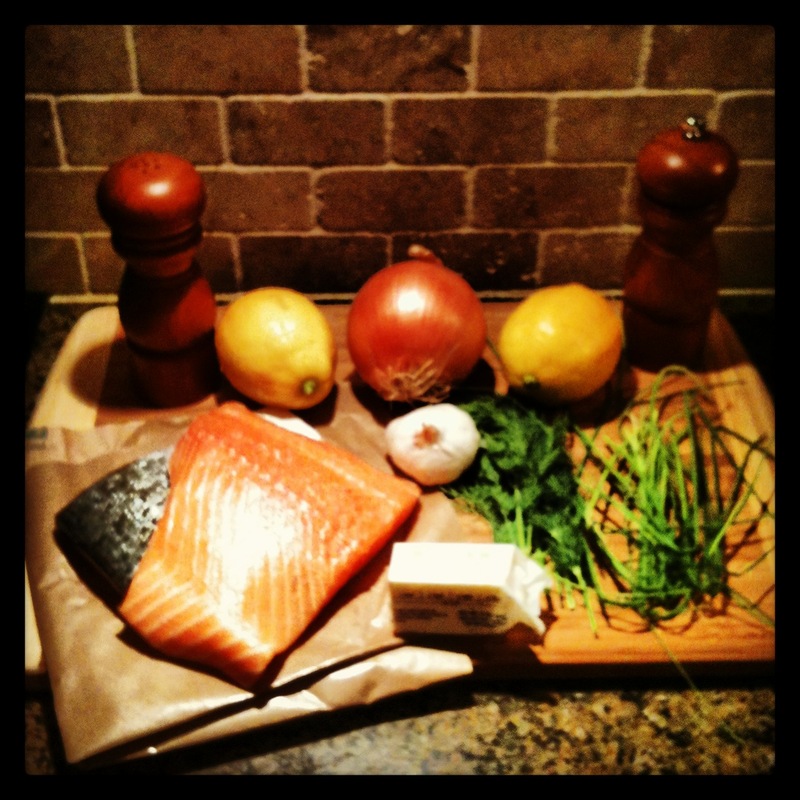 I LOVE Salmon … as a matter of fact … it’s on the menu tonight. Cedar planked, on the BBQ !!! Hi Jason … regarding your desire to “Plank” something … check out a post I wrote a while ago. Planked ribs, huh? That’s a cool idea! Would be nice to have an alternative to running the smoker in the snow… as fun as that is!